Actually the first thing I changed in here was replacing the art over the bed to these antlers that I moved from the great room. I love them hanging on the faux planked wall. They gave the room a cabin feel and then the pillows were found and the theme came together using other items I had. These are the cute pillows. They even have feather inserts and were so cheap. It's a good thing since I buy a lot of pillows. I also found this cute ski pillow along with the plaid pillows at HomeGoods. The back of the pillow is also a nice plaid so it can be reversed. The blue pillow with leather trim was found when I went shopping with my sister and mom in a new to me shop. I bought it several weeks before finding the other new pillows. They just all seem to go together. I love when that happens. My snow boots are ready. Yes, I have snow boots from a trip years ago snowmobiling in Jackson Hole in blowing snow and 11 degrees. After freezing that first day I found a shop in town and bought the right undergarments for warmth and the new boots. I was toasty warm on the next ride. To add more to the cabin feel in here I added a snowy trees and deer on the night stands. I made a garland with snow capped ornaments and critters. there are plenty more in this armoire. Just help yourself. I also found the cute wrapping paper on the two top boxes at the same time as the pillows. It was like they all belonged together. I already had the red houndstooth paper. I hope you enjoyed my cabin style guest room. It was fun creating it. Now, get comfy and maybe a drink and snack and enjoy the tour! 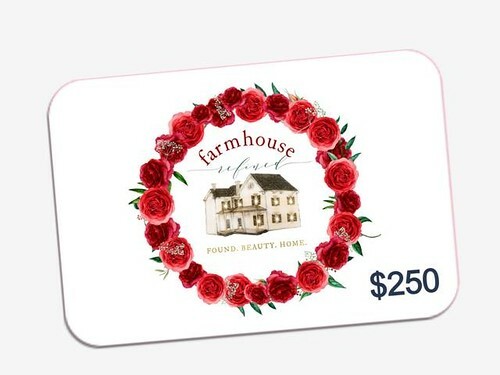 We have a fabulous giveaway of $250 to Farmhouse Refined - a new on line shop ( think Painted Fox sort of items ) US residents only. The giveaway will be run thru the bHome App .... Simply download bHome and favorite ( TAP the star for ) Farmhouse Refined . Automatically entered! No need to even open a message. The message will now say "Thanks for entering..."
So now only ONE TAP to favorite and you are entered. The App will pick the winner on December 9th and the winner will be notified on app and by email. Love your room but then I always do love what you do! Hope you're healing some after your loss! Holidays can be hard, I know! LOVE how you transformed this room into a beautiful guest room that you would find in a 5 Star Ski Resort or Mountain Retreat!....Those pillows are perfect. You always seem to find great ones at HomeGoods...not so much for me here as I think they fly off the shelf as soon as they land on them! Love all the details as they are so befitting for a your Christmas cabin look...and what a great idea to string those ornaments at the foot of the bed as a garland...you did good!! !....OK...put me on the reservation list and let's see if the snow boots are my size! Pinning away! Awe, thanks, Shirley. You know you can come anytime! Kim, I absolutely love this!!! We have made so many trips to Colorado to snow ski and this brings back so many wonderful memories. Now if you can promise snow and downhill skiing, we might want to book your guest room for a week!! Happy Sunday! Thanks, Pam, I'm glad this room sparked some nice memories! I've said this before ... you always have the best pillows! This room is so pretty and is perfectly dressed for the season! This space is chock full of all of my favorite things. Beautifully done! What a cozy spot!! I'm in love with all of your pillows, especially the ski one :) !! Happy Holidays! Can I book a reservation in this room? Soooo cozy! You really scored some great pillows! Sure thing, Sheila. I'll jot you down. Oh, Kim! I love every version of your guest room but this one takes the tops! Those pillows! (sigh) The wrapping paper! (sigh) You amaze me with your ability to transform your rooms! Oh, Jane, your're too sweet! You always surprise your readers with cute and new and colorful posts!!!! Thank you, Anne. I hope I can keep them coming. Thanks, Pam. I hope you find one! OMG Kim your guest room is gorgeous. The beautiful woodland cabin feel is so cozy and fun. Every inch is done so sweetly. Love that woodland garland hanging on the bed. I hope I can find that pillow you got at our HomeGoods. My SIL and family are big skiers so I have her in a grab bag for Christmas and would love to gift her that pillow. It is just adorable. Thanks for sharing where you got it. Happy Holidays. Thanks, Kris. Good luck with the pillow hunt! Absolutely gorgeous. Love the colors and the sweet garland at the end of the bed. So festive!! It looks like a wonderful winter cabin getaway! Thanks, Lidy. I would love to have you stay here. We can go antiquing! Thanks, Lory! It's a favorite of mine, too. This room looks just fabulous, Kim! You have completely nailed it with this cozy cabin style. I am pinning away for ideas for our cabin. Happy Holidays! This is right up my ally...or should I say lodge. All you need is a little snow outside ;) I don't think we can make that happen, but we can pretend. Beautiful room, Kim! Thanks, Julie. Yes, we will pretend it's snowing here. Love, love, love this charming and cozy room, Kim! You have such beautiful style! As an avid downhill skier, and loving the "lodge look", I am totally enamored with your guest room! Fabulously themed decor items and colour coordinated pillows make this one terrific room. I'd love to stay at your "cabin"! Thank you, Lori. I have no clue about skiing, but glad I nailed the look. What a cute room Kim! Oh Kim, I LOVE this! The ski pillow is adorable and I love the plaid ones too! The antlers are perfect in here now. I need a reservation, do you have any openings as I am sure you will be booked solid!!! Wher did you find the birch logs, love them too! Beautiful room!!! Pinky, I ordered those on line last year. I googled birch logs. Thanks! Thanks, Diana, that was the look I was trying to achieve. No, the boots have been worn once since our trip to Jackson Hole. We need more snow. Just beautiful, Kim! Looks like a page out of a magazine. the room is just darlin. you need to get those boots on and go have some fun! Make it snow and I'll wear them. They are toasty warm. Love! You know me and tartan. I would have taken those pillows home too. Your guest rooms are always inviting. Aren't they just too cute? Thanks, Sarah! So sorry about your loss...that is how I found your blog through reference of your dad's passing on another blog. It is a difficult time of the year to experience loss. I can relate. Keeping you and your family in my prayers. Love this post. Wondering if you made the darling sock hanging on the armoire? Thanks so much, June. No, I didn't make that. Afraid I'm not good at sewing. WOW your guest room is beautiful and it really looks like your up in the mountains. Great job Kim. Another warm and inviting room! I wish you could walk through my house and tweak (or completely redo) each room! Merry Christmas! Kim, You just let me know when there is a vacancy to stay in this room. :) It's perfect...especially for this time of year! Awesome job! KIM! This room! I adore everything, I could spend hours studying these pictures, you are so talented, my dear. I absolutely love this room, the cabin feel right down to the very last detail and I love the cushions and festive touches, especially the tree in the creamy white metal bucket. I will come and be a guest any time! I think this is one of my favourite rooms you have done. Love your choice of the navy blue and the plaid....and that ski pillow, so adorable! What a beautiful cozy room. I want to come and stay for awhile. Love the plaid pillows!! What a beautiful cozy room. Love the plaid pillows. Would love to come and stay for awhile!! I think this might be my favorite guest bedroom! Bravo! I love this!! Kim, I want to express my condolences also for the loss of your father. In a way it is a difficult time of year to suffer that kind of loss, but, in a way, it might be a good time as you will be connecting with friends and partaking of the spirit of joy that is present during the holidays. It could be up-lifting, reminding you of the caring available to you from various individuals. I hope that is true for you. Your cabin bedroom re-do is very inviting. I'll book a reservation, too! Also, I tried to enter the bHome giveaway, but I'm not sure I did. I couldn't find a star to click on on the page your link took me to. Any ideas? Naomi, thank you for your sweet words. If you tapped the star and it went through you should have gotten a message that said thanks for entering. I have not had to do it myself since I don't want to enter the giveaway since I'm part of bHome. If you downloaded the app on your phone or ipad and then click on the star to favorite Farmhouse Refined you should be entered. Did I miss how you did that gorgeous faux planked wall? Such an inspiring room! Thank you. I adore this room! I was already missing the touches of red around your home, and here you are at it again, LOVE it! Such a gorgeous room, Kim! I love all your rustic Christmas details. And the matching bow and wrapping bow was the perfect find. I visited last week Kim, but couldn't leave a comment for some strange reason, so back today to tell you how much I enjoyed your guest room for Christmas. Especially love that quilt at the end of the bed!! Pinning and sharing. Merry Christmas. I totally feel that this room, is always a whole new space everytime Kim! you are just absolutely so creative! Your guests for sure will feel welcome here in or out of the holidays! Thank you for joining the 12 days of Holiday Homes tour! Have a very Merry Christmas! Love the room. I am, like many in love with the pillows! I went to our home goods in search of the ski pillow, no luck. strange question, but is there any brand label to search. Too perfect not to try & hunt one down. Thank you!!! Linda, no, there isn't a tag on the pillow. Sorry. Hi - I love the basket with the logs and greenery. So cute. I've been on the hunt for a nice backpack type basket. Do you remember where you found yours? Mine is vintage and found at a local flea market. Check out some local flea markets or maybe ebay. I just love this room and was wondering where you got the striped vintage looking pillow shams, the bed frame, and the white/navy quilts? I just love this room and was wondering where you got the striped vintage looking pillow shams, the bed frame,the bed skirt, and the white/navy quilts? The shams are from Taylor linens. The quilts are pottery barn. The bed is from overstock but several years old and the bedskirt is from wayfaiir. Oh my goodness Kim. I think this is my favorite version of your guest room! So warm and inviting. You did a wonderful job, as usual.